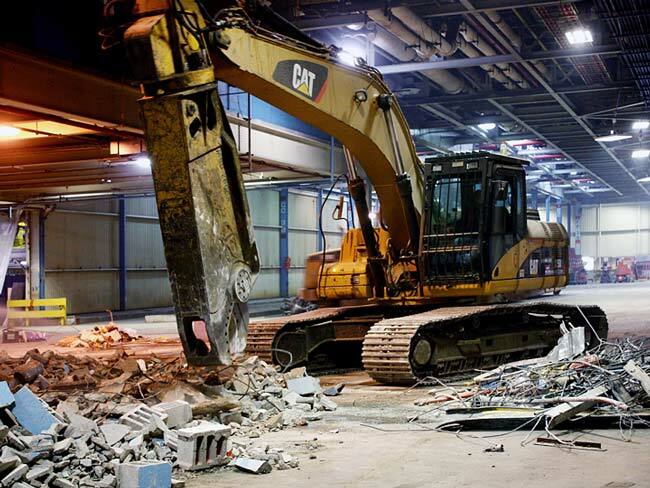 Strip Out & Demolition | North American Dismantling Corp.
Moraine, OH – This project consisted of the removal of approximately 50,000 sf of paint ovens and 10,000 sf of paint spray booths located on the second floor and grating level of the plant directly adjacent to the operating paint shop. There were several factors that made this a very complex and unique project. Aside from being located directly adjacent to the paint shop, the second floor and the grating level were built over the old roof (R-1 Level) of the existing assembly plant with an active assembly line located directly below the roof area. The use of water for fire protection had to be minimized and all openings in the R-1 level had to be protected to prevent any foreign mater from entering the assembly area. Also, active paint conveyors were located on the R-1 level directly below the demolition area which had to protected from the demolition operations. Absolutely no dust or foreign matter could come in contact with these systems. Another hurdle to overcome involved having no major access and egress to the demolition area until NADC designed and installed a series of structural steel bridges consisting of 60 tons of material connecting the demolition areas to a drop zone at the edge of the existing building. This operation required opening the existing building in five separate areas and installing a weather protection system to eliminate any elements from entering the plant. The construction of these bridges included airlifting structural members utilizing helicopters, which was completed on plant down time (Sundays and Holidays). North American Dismantling was also responsible for the design/build of $1,200,000.00 of the structural steel/grating and concrete utilized in filling all openings where the booths and ovens were removed, along with utility disconnects, rerouting and re-supporting and the relocation of existing process equipment. Additionally, during the course of its contract GM requested North American Dismantling remove an existing 240-foot long, 80-foot wide and 80-foot tall Automatic Retrieval System (Stacker Building). This structure was connected on two sides and was 30 foot taller then an existing building, which was to remain. This project was completed on schedule, with limited change orders and without interference to the plant’s existing assembly operations.